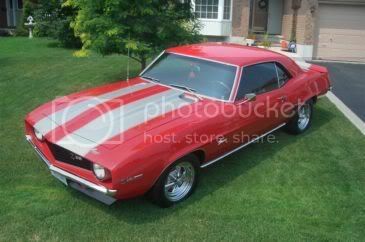 Hi new guy from Alberta , man I can hardly wait for spring i'm in need of some cruise'n !!!!!! I am Camaro nuts , when I learn my way around I will post some pictures. I can't belive I have not bumbled onto this site before. Always nice to see a fellow Albertan, where about in Alberta are you? Athabasca.... not too far from you . That's a lovely looking Camaro you got there! Welcome. Always nice to have another 1st Gen owner. Beautiful car. If you could please add in your location to your profile, that would be great! Thanks! BTW: How far away from Calgary are you? Calgary is 450 km from me and now with the Anthony Henday Dr., Edmonton's ring road, it's way faster . Welcome, that is a sweet ride. I'm 2 hours from Edmonton and about 5 from Calgary. We gotta get us Edmonton area members together for a cruise this summer. Race you around the Anthony Henday .